Don't we have enough of that stuff already? This is different. This could lead you to joy, love, peace. Sometimes our ego doesn't want us to do the 'spiritual work' or practices that will heal and transform us, align us with our higher being, and enable more of the love, flow, joy and success we desire and deserve. It is like we have a strong resistance to living in our personal vortex of bliss. It is only in your personal spiral of evolvement that you can know your source and your Inner Being. Aine Belton calls a commitment to your spiritual path BLISSIPLINE, as a reminder that the rewards are blissful indeed! Don't you just LOVE this new word! Anything that releases constricting thoughts, feelings and beliefs, and opens you to a greater awareness of your true nature and the true nature of reality, aids your spiritual path and aligns you with your vortex. This path inevitably involves a level of intimacy with self. Sometimes we resist this intimacy (with busyness and 'distractions') if there are painful or uncomfortable feelings that we have repressed and wish to avoid. This is understandable, and we may not even be conscious that we are denying or repressing these feelings. Yet in escaping ourselves, we also escape the way through - the way out from a limiting self-created illusion into the sunny terrain of love, truth, and dreams come true! 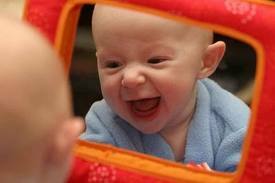 Change begins with recognition and acknowledgement, which involves looking in the mirror. Do so with compassion, always. And, if you can, smile. Don't take yourself so seriously! Instead of running from your fears, stand and wipe the steam from the mirror instead, and witness the love, beauty, innocence and power of your True Self shining lovingly back at you. When we shut off our emotions to avoid pain, we shut off the lighter, positive feelings of love, happiness and joy, too. One of the best ways to release your emotions is to FEEL them! Many people are more scared of this than they consciously realize or admit. This doesn't mean indulging in them or giving them undue attention if they do not serve you (i.e. nip that self-pity in the bud), but it can mean diving into them and letting them be fully felt. Don't run from your feelings. They are allies and point to what needs healing,clearing or aligning within. Doing so will change your reality accordingly. You are source, not subject, of your world. Use your painful emotional teachers to heal your life. and others, and changing your beliefs, can clear whole clusters of emotions. Further, the more you take responsibility for your life, (that means all of it- the good, the bad and the ugly) the more you move from blame, control and victim, to living a life which is free and empowered. You are not your darkness, failings or mistakes. Be loving and compassionate with yourself and forgive yourself. Meditating daily has numerous benefits, from improved health, reduced stress and anti-aging benefits to the gifts of clearing and raising energy, inner peace and centering, connecting to your Higher Being, and receiving divine inspiration. Even just 5 minutes once a day will be beneficial. You can extend that to 2 (or 3) times a day, and move from 5 minutes to 10, then 20 minutes. A daily visualization routine can be integrated or added along-side your daily meditation. It could be something as simple as visualizing your goals for a few minutes each morning and/or night. It creates the structure and framework for energy, momentum and implementation to bridge the gap between you and your goals. You might also want to read a goals list each morning and/or evening of the current goals you are focusing on. Allow yourself to feel grateful for at least 5 things in your life each morning as part of your blissipline routine, and at the end of the day for things that happened during your day that you are grateful for. It is useful to have a gratitude journal for this purpose. This will align your vibration to that which is good, true and beautiful in your life, to that which you love and appreciate, and attract more of the same at an expanded level into your life. Remember, the key is FEELING the gratitude more than thinking about it or writing it down. Spending time in nature is healing. The wondrous energies of flowers, plants and the nourishing energy of Earth herself, have a very rejuvenating and transforming effect on your being. Being in nature will also ground and discharge negative energies, as well as open your heart and uplift your spirits - food for the soul indeed! It can also give you time to stop, reflect, be at peace, and be with yourself to receive insights and inspirations and ponder. Spending time in nature is healing. Doing more of what you love and what brings you joy will raise your vibration significantly and attract more success, happiness, joy and opportunities into your life in all areas! All work and no play makes for a dull day. For a high vibration that will boost your all-round attractor factor, be sure to add regular FUN to your weekly schedule! "No amount of self-improvement will make up for a lack of self-acceptance". Robert Holden. The more you accept yourself as you are, the more you let go of what you're not. Quit the self-punishment, blame, inner criticism and self-condemnation. End feeling guilty for it serves no one. Clear your limiting beliefs about yourself once and for all. There may be times this is easier than others, but make it your overriding intention. Love lies at the heart of all that you seek, and separation from it at the root of your troubles and pain. Let love be a guiding light in your life that will steer your ship through stormy waters back to the shore of truth, happiness and joy. We all love to love and be loved! It doesn't get better than that! Love is the highest vibration in the universe. The more you love yourself and others, the happier, brighter and more successful your life will become. And know you are loved. You are loved totally and unconditionally by the source of creation. When you are in your personal vortex, you are also in the vortex of All-That-Is. There is nothing you need do to win that love and nothing you can do to lose it. Your Inner Being knows this truth. Listen. BE. If you enjoyed this, please share it with your friends! 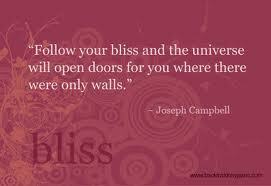 Live in your bliss. Choose the discipline! Be good to you!